Through his Twitter account, former Special Assistant to the President (SAP) Christopher “Bong” Go confirmed the incident that a 90-year-old man was arrested for breaking into his office allegedly plotting to assassinate him and President Rodrigo Duterte. In a report of Radyo Inquirer 990AM, the authorities named the suspect as Bambaran Bantog. He was brought to the police station by the soldier who was guarding the office of Go. 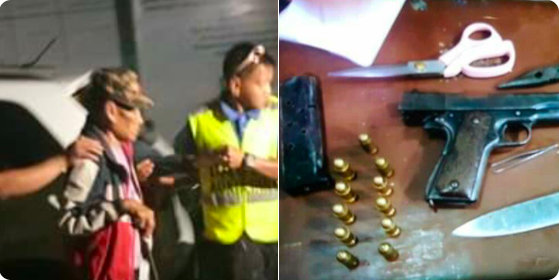 When the authorities frisked the suspect, they were able to recover .45 caliber, 11 bullets, and two other sharp weapons that the suspect brought with him when he came to the office. In a report by Pilipino Star Ngayon, the suspect admitted that his plot was to assassinate President Duterte and Bong Go. The authorities have been trying to convince the suspect to tell them the mastermind of the assassination plot. Bantog is set to face charges of illegal possession of firearms, deadly weapon, and violation of gun ban during the election period. How did a traffic enforcer raise P350M in 12 years? Just a simple netizen who wants to share the Political views, Current Events, Viral or Trending on social media sites and Opinions of different people.